Winter plowing and sanding bid packages will be available April 18th @ Frankfort Town Office. There will be discussion about fishway designs and fire department’s dry hydrant. 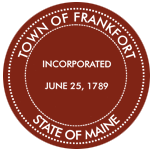 Bid opening for paving 2.75 miles of town road. Bid opening for providing winter sand, gravel, gravel road grading, equipment prices, street sweeping and roadside mowing. Q&A for winter plowing and sanding bids. Bid opening for winter plowing and sanding services.